Found this one fully restored British vintage 4x4 off-road vehicle produced by Land Rover. As shown here is a Land Rover Series III 88 3-Door built in 1974 VIN: 90636032 has been totally restored like new condition, it has a 2.25 L I4 Diesel engine mated by manual transmission that was looking for a new home. 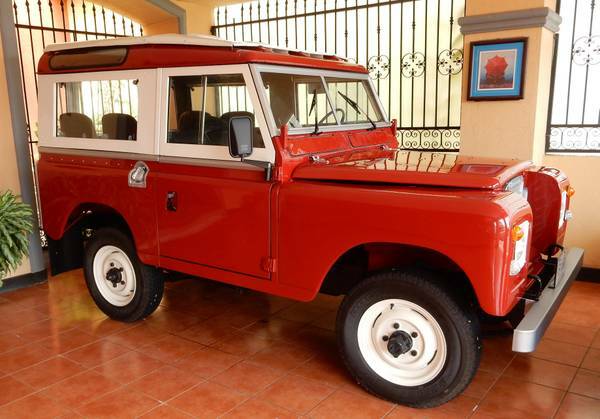 Beautiful, fully restored 1974 Land Rover 88 (short wheelbase). A full, complete, frame-off restoration was completed in February 2016. All mechanical components were overhauled, replaced or repaired including the engine, transmission, hydraulics and brakes. New interior with handsome cream headliner. This Land Rover sports original wheels and new tires. This vehicle is the classic, full off-road capable, daily driver you have been waiting for. With its legendary and freshly overhauled diesel engine you will enjoy this Rover for many years to come. Serious inquiries only, no trades. Offered at $31,500 OBO, FOB Miami, FL (applicable sales tax, other taxes and transfer fees not included, sold AS-IS, WHERE-IS, no warranty given or implied).